Once in a blue moon I’ll find something that is so perfectly up my alley that I’ll say to myself, “this really shouldn’t exist”. Tadaaki Misago and his Tokyo Cuban Boys is one of those things that shouldn’t exist, but thank the music gods it does. There’s very little information out there about this all-Japanese Latin Jazz big band, but the very brief jist of it is as follows: in post-war Japan, the Latin music that was exploding into the mainstream in the USA reached Japanese ears. Some very talented musicians led by one Tadaaki Misago formed a band and learned the latin jazz form. They became popular enough to release some 200 albums over the years, most of which are undocumented on the internet and presumably very difficult to find. From what is available on the internet (youtube, spotify, etc.) the majority of their work is pretty straight forward latin jazz in the vein of Perez Prado, Xavier Cugat and so on. They broke up in the 80s and under the leadership of Misago’s son, the band was resurrected in 2005. There are some wonderful videos of the new Tokyo Cuban Boys on YouTube: here and here. You’re welcome. A Japanese Latin band called the Tokyo Cuban boys, is magical and all, but it’s just not enough to warrant a post that serves to resurrect this website after a 4 year hiatus. There’s something very special about this record. This particular record by the Misago and his Tokyo Cuban Boys is an aberration from the band’s available material. Instead of straight forward big band latin jazz, the cuts on this record are laced with a late-70s/80s dose of psychedelic funk fusion. It’s all Latin standards done through a really grooving 70s blacksploitation film soundtrack lens. The album starts out with a version of Angelitos Negros that would make Quentin Tarantino go hard. If Kill Bill was set in Miami this album would be the soundtrack. Every cut is more marvelous than the last and what really makes this Garbage and Gold material is that this record barely has any presence on the internet. It’s very unlikely that you’ll hear these cuts elsewhere and certainly not at this quality. Here it is for your listening pleasure. From the over-packed shelves of Yesterday and Today records in Miami, FL… T. Misago and his Tokyo Cuban Boys… like you’ve never heard them before. I’m doing this one from the road, so I apologize for the lack of quality images or thoughtful writing. Here’s some good old-time music for the holiday. 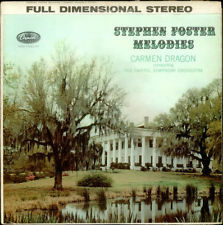 Carmen Dragon and his Orchestra perform Stephen Foster’s most famous compositions. These are beautiful versions of these songs, I much prefer them to the choral versions that you typically find. Perfect for driving through some southern landscapes or sitting in the comfort of your own home and reflecting on this great nation.